What will you be doing as you celebrate the arrival of the New Year? Here's a an idea to stay warm no matter how frightful the weather outside gets (or even if you're in warmer weather! 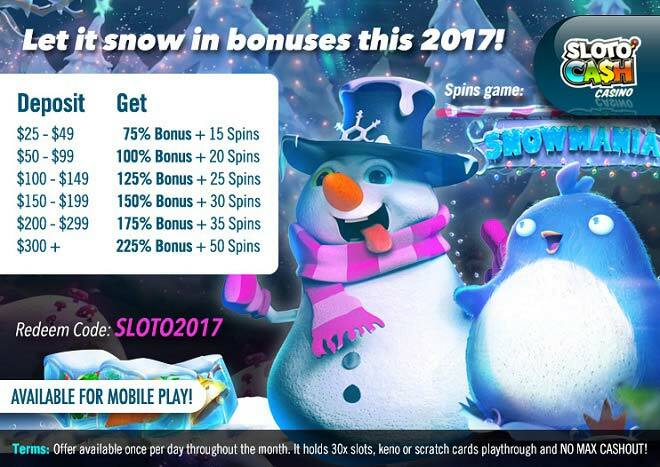 ): ring in 2017 cozying up with Mr. Sloto's Snowy bonuses and free spins! Don't let the chilly weather bring your celebration spirits down! Deposit as little as $25 and you'll be staying warm wrapped up in wins generated from a bonus of up to 225% plus 50 Spins! The reels of Snowmania will make your chilly days cozier when you win with wilds, multipliers and bonus round games! This frosty New Year is the perfect occasion to let it snow in bonuses as Mr. Sloto's 2017 celebrations continue with your deposits of $25 and up!